Imagine Easter eggs hiding in the dappled spring sunshine. That's what started these spring leaves. 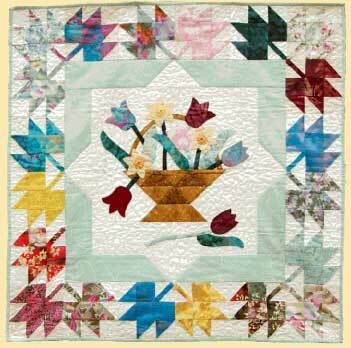 And what better to go with them than a pieced basket of appliquéd tulips and daffodils! The first of the Buddy Quilts, gather up your pals and pick a handful of jelly bean leaves. Swapping is always optional with Buddy Quilt patterns.